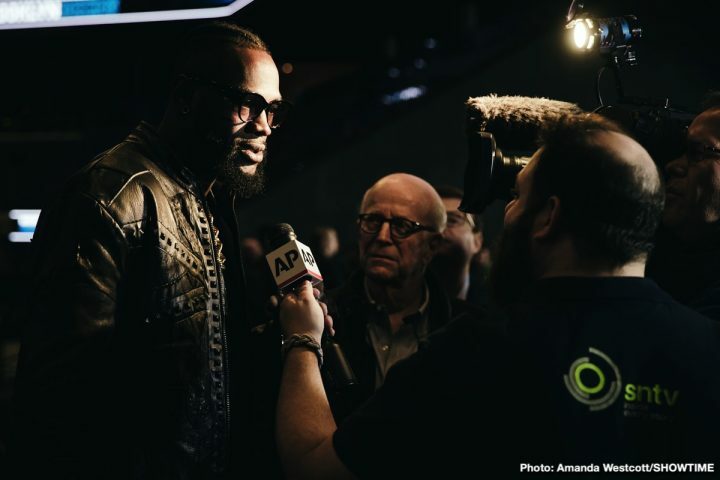 By Tim Royner: WBC heavyweight champion Deontay Wilder says he won’t regret hurting mandatory challenger Dominic Breazeale when they face each other next month on May 18 on Showtime Championship Boxing at the Barclays Center, in Brooklyn, New York. Wilder, 33, sees boxing as the hurt business where a fighter can be permanently hurt at any point in a fight. He feels that it’s either him or his opponent. It’s that kind of a sport. In other words, it’s war in the ring. To some boxing fans, Wilder is intentionally turning himself into a villain in order to sell his fights. Whether fans like it or not, being the bad guy sells in the sport. It’s like professional wrestling. The wrestlers that are seen as bad guys are considered the most popular. The Wilder-Breazeale isn’t a great one, so if Wilder can help drive some interest in the fight by making hyperbolic comments, he can more fans interested in seeing the match. Unfortunately, there’s not a lot of demand for a Wilder vs. Breazeale fight by the fans. They want to see Wilder fight Anthony Joshua or Tyson Fury. But since those fights are not happening right now, Wilder has to make do by facing 2012 U.S Olympian Breazeale in order to satisfy his WBC mandatory commitment. What’ll be really interesting is if Matchroom Boxing promoter Eddie Hearn gets his way with the WBC ordering Wilder to defend against a secondary challenger in Dillian Whyte. That’s what Hearn wants. He’s asked the WBC to order the Wilder vs. Breazeale winner to face Whyte without an intervening fight. Whyte didn’t take part in a title eliminator with the World Boxing Council. But Hearn feels he should be made the mandatory automatically because he’s been ranked #1 with the WBC since 2017. Wilder vs. Whyte will be a really violent fight with both guys trying to score fast knockouts. This isn’t the first time that Wilder has spoken like this. He’s said in the past that he wants a body. It shocks boxing fans, but that kind of thing also attracts interest from people. It makes the fights more like modern gladiatorial encounters like back in the days of the Romans. Wilder has knocked a couple of fighters really badly during his career. His knockouts of Artur Szpilka and former WBO heavyweight champion Siarhei Liakhovich were both scary to watch. Most recently, Wilder’s knockdown of Tyson Fury in the 12th round last December was a bad one. Fury looked to be unconscious after Wilder hit him with a left-right combination. The referee Jack Reiss surprisingly didn’t immediately waive off the fight despite Fury appearing to be out cold on the canvas. Fury’s fans complained that he was robbed after he got back up and finished the fight on his feet. But the fans didn’t point out the obvious that Wilder would have had a knockout if the referee had done what most referees would have done in that situation and stopped the fight. Top Rank Boxing, who recently signed Fury, decided they didn’t want to put him back in with Wilder so soon. You can argue that with the way Fury was knocked down by Wilder in the 12th, the chances of him being knocked out quickly by Wilder in the rematch would arguably be high. Top Rank choosing to let some time go by before letting Fury fight a rematch with Wilder might help him handle his big shots the second time around. There’s definitely bad blood between Wilder and Breazeale, and you have to wonder whether the comment from Deontay is part of that. It sounds bad that Wilder wouldn’t have any remorse, but that’s how he feels. People can’t govern other fighter’s thoughts. If Wilder genuinely won’t care if Breazeale doesn’t recover from a beating at his hands, then that’s his opinion. Wilder puts his own life on the line each time he steps foot inside the ring. Most boxing fans don’t know what it’s like to get inside the ring and have to deal with an opponent that is trying to knock you out. “People on the outside will never understand this sport,” Wilder said. “We are fighting for our lives in the ring anyway. Anything can happen. Your head is not meant to be hit in the first place. One little tap can end it all. You talk about me killing the guy? If it happens, it happens. When you are dealing with a situation like this and it’s personal, I don’t mean well for him, nor do he mean well for me,” Wilder said. Wilder isn’t going to change his opinion about what he feels about his opponents just because the public might not like the way he thinks. He says he’s just being honest in saying that he won’t have any remorse if he hurts his opponents. It’s not politically correct for him to talk like that obviously, but if that’s the way he feels, you can’t tell him to stop being honest. Breazeale, 6’7″, has gotten on Wilder’s bad side with the back and forth trash talking that has been doing on between the two. Wilder might want to get into Breazeale’s head a little bit by making some over-the-top comments about having “no remorse” if he hurts him. If Wilder can get Breazeale fighting scared, then his job will be that much easier on May 18. As it is, Breazeale isn’t much of a puncher to speak of, but he has decent power when he’s sitting down on shots like he did against Eric Molina, Carlos Negron and Izuagbe Ugonoh. Breazeale won’t have much of a chance of beating Wilder if he fights scared, thinking about the “no remorse” comment he made. With the money that Wilder can potentially lose if gets beaten by Breazeale, it’s in his best interest to psych him out ahead of time. Getting beaten by Breazeale would hurt Wilder’s career, as he’s got two big fights on the horizon available to him in a rematch against Tyson Fury, and a unification with IBF/WBA/WBO champion Anthony Joshua.